I’m entering week two of this 21-day sugar detox thing and what I’m finding is that this makes eating even more of a challenge. Maybe I have cracked up. But, really. No fruit, no dairy, no carbs, no grains, no sugar and no fake sugar. And definitely no alcohol. It kind of eliminates everything we like to eat and drink. My husband smartly assessed that this detox program is reminiscent of the first few weeks of the South Beach diet where you only eat protein and vegetables. And he’s right, so let’s just consider the 21-day sugar detox program a modern day reincarnation of the South Beach diet that was so hot in the 2000’s. Rather than think about what I can’t eat for the next few weeks and rather than walk around hungry and crabby, I’m getting creative because resourcefulness is the key to ingenuity. Snacks are a necessity in this adventure. Normally, my go-to snack would be a piece of fruit, a little yogurt and Cowgirl Granola or some cheese. Who eats cheese without crackers you are probably wondering? I used to be a cracker nut. From Carr’s water wafers to seeded crispbreads, I used to eat them all. They are a great little snack to enjoy with cheese, fruit and a glass of wine–none of which I can have right now. 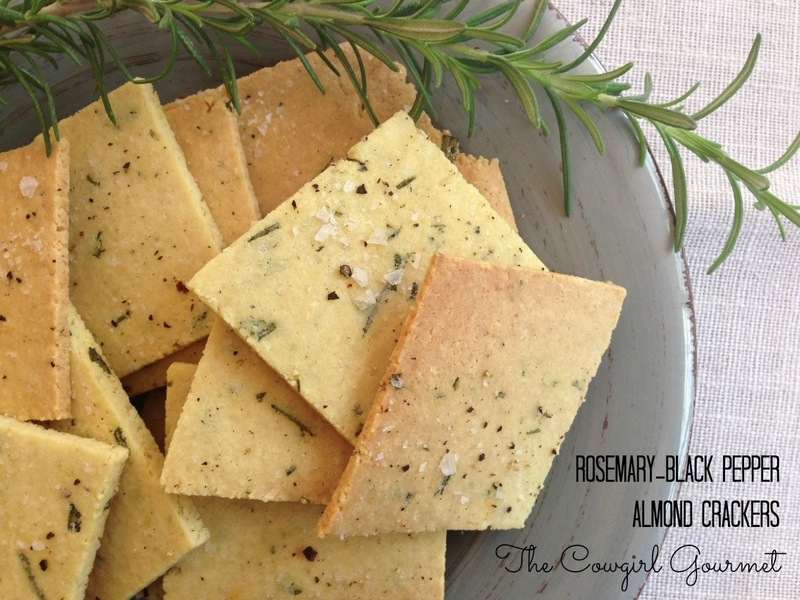 And then I remembered about this gluten and grain-free cracker recipe I used to make a few years ago when I first got on the gluten-free bandwagon. All you need is almond meal, an egg, a drizzle of olive oil and herbs of choice. Perfect. Not only is it perfectly legal on the 21-day sugar detox, but brings with it a very welcome crunch factor. I whipped these together in less than 30 minutes and definitely enjoyed a crunch-tastic snack. If you're a cracker lover like I am, you'll flip over this healthy gluten and grain-free cracker alternative that is so simple to make and so utterly delicious! In a food processor, crack the egg and add the olive oil, salt, rosemary and pepper. Pulse a few times so everything gets blended. Add the almond meal and pulse until the dough comes together. Remove the dough from the food processor, form it into a disc and place it on a parchment paper-lined baking sheet. Top with another piece of parchment paper that is equal in size. Now get out your beloved rolling pin and get to work, rolling this way and that way so that the dough becomes flat, about 1/8" inch thick. Remove the top sheet of parchment paper. Cut into 2 inch crackers and then sprinkle with Maldon salt and more freshly ground black pepper. Place in a 350 degree oven for 20-25 minutes, rotating the baking sheet once after 10 minutes. The outer edges will brown and the inner pieces will remain light in color. Mmm those look great! Good luck on the detox. I was unable to use a processor, but a lot of mixing with fingers did the trick. I think I will make them thinner next time, but they went fast!